Kayla Reed (pictured center) of the St. Louis Action Council & Electoral Justice Project / Movement for Black Lives speaking at a Neighborhood Funders Group at a screening discussion regarding the film Whose Streets, in conversation with Filmmaker Damon Davis (left) and Eric Ward, Executive Director of the Western States Center (right). Photo courtesy of the Neighborhood Funders Group. At its biennial national convening, the Neighborhood Funders Group, whose membership includes over 100 place-based funders, brought together foundation program officers from across the country to St. Louis, Missouri. A central focus of the group’s gathering this time was to examine the state of the country’s racial justice movement four years after the police shooting of Michael Brown in Ferguson, an event which helped launch the national Movement for Black Lives. The police shooting galvanized the nation but, unfortunately, was far less extraordinary than many white Americans would like to believe. Prompted by the Ferguson shooting, the failure for the shooting to result in a trial (to say nothing of a verdict), and the national response, the extent of public scrutiny has increased. The Washington Post, for example, now issues annual reports on fatalities resulting from police shootings, which regularly total close to 1,000 a year. The 2018 number, as of June 20th, stood at 501. Despite body cameras, police training about implicit bias, and similar measures, the overall number of police shootings remains grim and stubbornly consistent. The Neighborhood Funders Group aims to join together grantmakers to advance social justice and community change. At the conference, members took stock of the state of social justice and asked challenging questions about how to deepen social justice work. Reverend Starsky Wilson, CEO of the Deaconess Foundation, gave the keynote address. Wilson noted that the year 2014 marked the 250th anniversary of the founding of St. Louis. As a result, Wilson noted, before Michael Brown was shot, St. Louis philanthropy was in a celebratory mood. In June, for example, Charity Navigator declared St. Louis the most charitable city in America. Other accolades for the region’s Urban League, Big Brothers/Big Sisters, and United Way institutions also came in. Wilson says the Ferguson Commission, on which he was a co-chair, and which continues its work in a group coming out of the commission called Forward through Ferguson, led to some valuable changes. For instance, St. Louis public schools had the largest and highest level of racial disparity in the state when it came to out-of-school suspensions. The number of annual suspensions fell from 13,000 to 2,000 after new policies—including one that banned suspensions for children in kindergarten, first, and second grades, among other efforts to change the school district culture—were put in place. As for the foundation he leads, Wilson notes that the events in Ferguson started Deaconess on the path to move its offices from an office tower downtown into the neighborhoods to better support the communities it serves, opening this year the brand new Deaconess Center for Child Well-Being. Rush moderated a panel that included Karissa Anderson, a master’s student of social work who also serves on the Deaconess Foundation’s Community Advisory Board; Blake Strode, executive director of Arch City Defenders; and John Chasnoff, an activist in the Coalition Against Police Crimes and Repression. Also in the audience, having helped lead the bus tour that took conference-goers to and from the library, was Kayla Reed, who hails from the Organization for Black Struggle and helped found the St. Louis Action Council, which focuses on electoral mobilization in the St. Louis metro area. And when people fall behind on those fees, the local municipal courts issue warrants. Strode notes that in metro St. Louis, which has 1.5 million people, there are 700,000 warrants outstanding, nearly one for every two people. In Ferguson, there were, as of 2013, more than 40,000 active warrants for 21,000 residents. By contrast, Cook County in Illinois (which includes Chicago) has 40,000 active warrants for 5 million people. In other words, a year before Michael Brown was shot, Ferguson had more than 200 times as many warrants per capita. Strode’s group, which has a staff of five and a budget of less than $1 million a year, has filed 40 civil rights cases, about half class-action. Areas of focus include working to eliminate de facto debtors’ prison policies, getting rid of cash bail, curtailing police misconduct, and improving jail conditions. Chasnoff added that another success was getting a Civilian Oversight Board in St. Louis established to monitor police behavior. Efforts had been underway for over a decade, but only succeeded in the wake of the community response to the Michael Brown shooting. Electoral activity has also been an area of focus. Karissa Anderson called attention to her work with #WokeVoterStL. Reed noted that her millennial Black-led collective has organized public debates with more than 1,500 local community members in attendance and helped elect St. Louis’s first Black circuit attorney. The level of activity is impressive, especially considering that many of the groups, like the St. Louis Action Council, are all volunteer. Of course, beyond metro St. Louis, Ferguson has had a national impact. The #BlackLivesMatter movement—out of which the coalition that constitutes the Movement for Black Lives (M4BL) developed—started in 2013, a year before Michael Brown’s shooting, after the death of Trayvon Martin in Sanford, Florida—a city of close to 60,000 residents a little more than a half-hour’s drive north of Orlando. 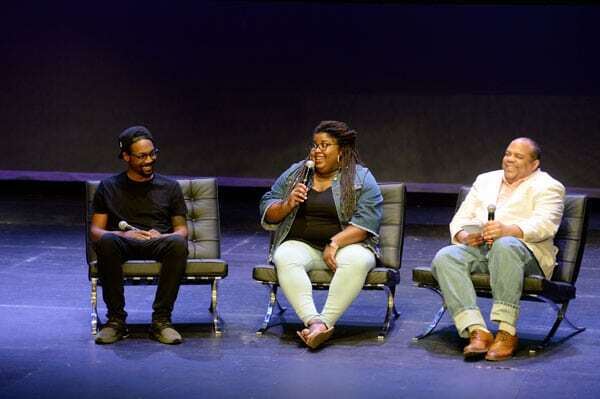 But the movement gained visibility nationally in the wake of Ferguson, so it was appropriate that the conference also hosted a panel of activists who have worked with M4BL. Fight white nationalism and neoliberalism. As M. Adams, co-executive director of Freedom Inc., explained, Project 2021 includes five key pillars: mass engagement, local power, direct electoral justice organizing, leadership development, and multiracial solidarity. Each pillar contains detailed action steps. For example, for mass engagement, M4BL has set the goal to engage four million Black people, which would mean reaching 10 percent of the US Black population. Others include creating a training program to prepare the next generation of Black leaders to act effectively in the media, raising funds to help bail out people awaiting trial (and possibly a second fund to help families facing eviction), and developing an M4BL app that can connect people to local groups. As for “local power,” Adams noted that M4BL aims to “identify five to ten localities” and focus resources on those cities to have a higher impact. By choosing to “contend for power in those 5-10 localities,” Adams suggested, the M4BL could “measure our ability to get done what we need to get done.” Adams said cities would be selected based on research and careful calculations, using “science, not just hope” to determine where support for Black mobilization might have a transformative political effect. Charlene Carruthers of BYP (Black Youth Project) 100 led discussion of the electoral justice pillar. This includes developing candidate questionnaires, political education webinars, and toolkits for “candidates who love Black people.” To be successful in electoral organizing, Carruthers notes, you need to mobilize and engage people in things they actually care about. McHarris added that M4BL has been financially able to support a dozen Electoral Justice leaders, who were selected out of 130 national applicants to support this work. Marbre Stahly-Butts of Law for Black Lives discussed the leadership development pillar. A strategic aim here is to develop a learning ethic. Part of this will involve holding between now and the end of 2019 four to six intensive trainings across the country on such topics as direct action, grassroots development, and strategic communications. Lastly, McHarris discussed the multi-racial solidarity pillar. “In 2014, we were exclusively focused on Black people, but we know we have allies across races and sectors that are also impacted and want to work with us.” The current need to not only defeat Trump but change the entire state of what is politically possible in the US requires M4BL to participate in multiracial spaces, McHarris explained. As noted above, two themes ran through the discussions—a high level of mobilization and a low level of resources. The national M4BL has more resources than local St. Louis groups, but still, an electoral justice fellowship that attracted 130 applicants but could only afford to accept 12 speaks to what are still quite limited resources. In her remarks, McHarris also outlined some of the strategic needs to be addressed to build the M4BLs capacity. Think tanks: This would involve diving down more deeply into key theoretical questions such as: What do we mean by “racial capitalism”? What do we know? What don’t we know? People’s Movement Assemblies (PMAs): Inspired by work in the South, such as in Jackson, Mississippi, the idea here is to focus on identifying: What do people want? What are you working on already? How can we work together? 2020 National Movement Convening: Building toward this is seen by M4BL organizers as a two-to-three-year process, already underway, to figure out what is needed “to envision and create the world we say that we want.” A central question here is: How do we move the broader left further left and to that vision? As a whole, the conference touched on many topics beyond St. Louis and the M4BL, including decolonizing wealth, building a community-based economy, the struggle for recovery in Puerto Rico, and how to foster a culture of equity among philanthropy. Still, coming to St. Louis and taking stock less than four years since Michael Brown’s untimely passing gave the conference an added sense of seriousness and purpose.